A reliable source for Industrial Washers information and a resource for accessing leading Industrial Washers and suppliers. Industrial washers clean, degrease and sometimes dry mass quantities of large or small industrial parts in preparation for distribution, surface treatment or assembly. Oils, chemicals, burrs and other residue left over from the fabrication process must be removed from the surface of parts before they can undergo the surface finishing process. Coatings such as zinc and electroplating cannot be effectively applied atop grease or contaminating dirt. Industrial Washers Industrial washers clean, degrease and sometimes dry mass quantities of large or small industrial parts in preparation for distribution, surface treatment or assembly. Oils, chemicals, burrs and other residue left over from the fabrication process must be removed from the surface of parts before they can undergo the surface finishing process. 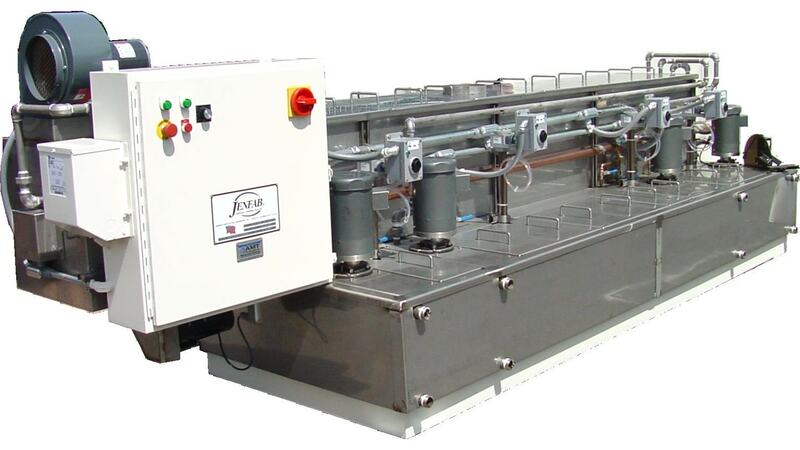 The two main methods aqueous industrial washers use are immersion washing and spray washing. Immersion washing, also called agitation, immerses unfinished parts in a hot organic or chemical water-based solvent in a wire mesh basket that rotates, turns, shakes and generally agitates dirt off of the parts. Immersion washers may be as simple as a tub in which parts are manually placed or removed, or they may be a series of tubs with different washing, rinsing and treating solvents and automated arms that move baskets between them. Industrial Washers - Jenfab/Jensen Fabricating Engineers, Inc.
Spray washers spray water and water-based cleaning solutions onto parts at high velocities to remove dirt; there are many different types of spray washers for different types of part washing. Cabinet washers, cell washers, conveyor belt washers, monorail/overhead systems, rotary tumblers and pallet/dunnage washers all utilize spray washing techniques. Most aqueous parts washing solvents have until very recently been chemical-based, but recent rises in environmental and worker safety concerns and regulations have made the use of organic solvents much more common. Ultrasonic cleaning is a new, innovative type of precision cleaning that requires far smaller solvent concentrations than traditional washing, cutting down on harmful and expensive waste. Tiny air blasts burst against parts' surfaces, cleaning effectively in crevices other washing techniques can't reach. Automotive industrial washers often use ultrasonic cleaning to reduce the risk of hazardous malfunction due to part contamination. The same is true for medical, surgical, dental and electronics parts washing. In an industry that depends upon exactness and precision, parts contaminated with foreign chemicals, oil, grease or shavings can mean the difference between smoothly operating machinery and loss of thousands of dollars or even lives. Industrial washers provide an essential function in industrial manufacturing, not only by providing thorough cleaning solutions but also by reducing labor costs. With the multitude of part sizes, shapes and cleaning requirements, industrial washer manufacturers often provide custom solutions, designing and fabricating equipment or equipment systems tailored to a company's unique parts washing requirements.